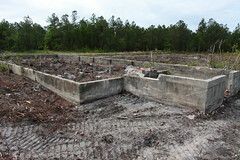 Holly Ridge, NC, is the former site of Camp Davis. Built during World War II, over 20,000 people were working during the height of construction. By May 1941, Camp Davis had 978 buildings, 32 miles of paved streets, and an airfield with two runways. 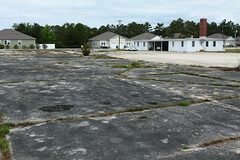 The base served primarily as a coastal artillery training center. It closed in 1944. 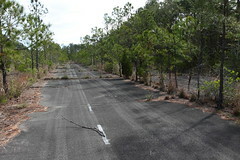 The airfields and surrounding land were re-acquired by the military in 1954, and are presently used as a Marine Corps satellite airfield. North of Highway 17, near Drag Strip Road. Along Highway 17, east of town. 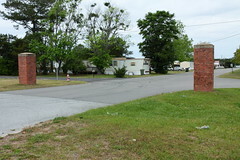 Around Camp Davis Road, center of town. Along Highway 50, north of town.